We ordered our new caravan back in May. After 18 months in our Mitsubishi Fuso Canter, we wanted to give caravanning a go. 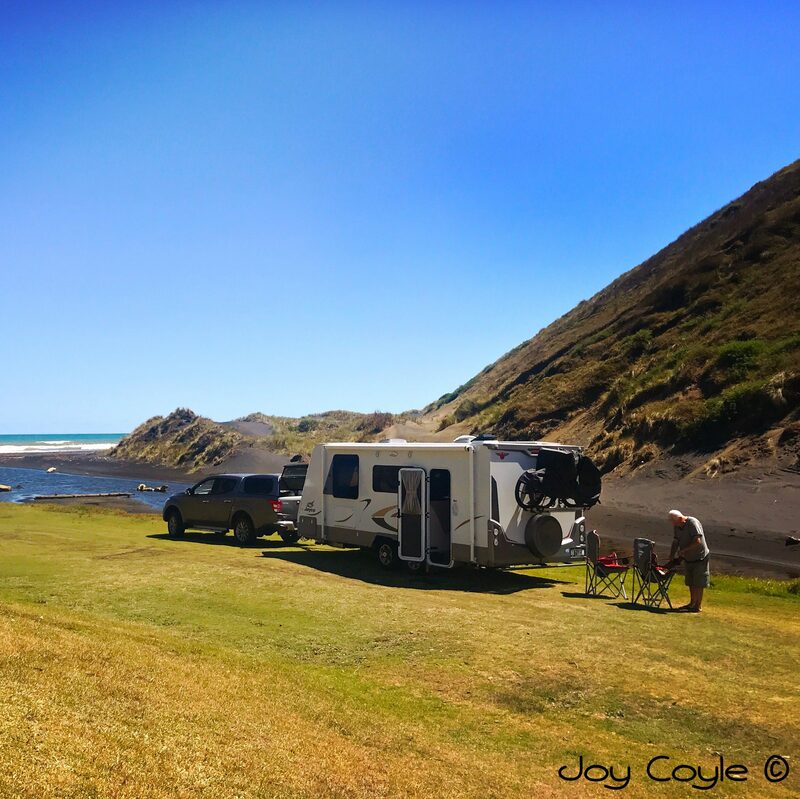 Deciding on purchasing a new Jayco Journey from South Auckland Caravans, we knew we’d be waiting till the end of September for it to arrive, and we advertised our motorhome for sale. We were somewhat surprised when it sold in two days, but fortunately for us, we were offered a flat belonging to our friend Vera, in Taupo. We accepted, and stayed there over the winter months before moving to rural Putaruru to look after our friends’ property for six weeks, from early September. Growing up in Taranaki, another dairying province, I love the rolling green tree-dotted hills around the Waikato. Our caravan arrived on time, and was duly certified for New Zealand requirements, and extras installed as we had requested. We were very excited, and it was arranged that we would pick it up on Monday morning October 8th. We decided to spend the weekend in Auckland with my cousin Dawne and her husband Bob in Howick. We travelled up from Putaruru on Saturday, stopping for lunch at the Native Tree Cafe on SH 27. We’d never stopped there before, and were impressed by the food selection, good coffee, and lovely garden setting. We sat outside and enjoyed the garden on a beautiful spring day. Dawne had invited another cousin, Wayne, and his wife Beryl, and friends Shirl and Marty, to dinner on the Saturday night, and we had a lovely evening. Catching up with grandson Ben on Sunday was a bonus. He and his partner were off to Rarotonga for a week the next day. So, the long awaited day had arrived! Pick up new caravan day. Monday October 8. We did the handover with Andrew at South Auckland Caravans, trying desperately to remember everything. He was great, and gave us his mobile number to call him if we got stuck with anything. We’d decided to spend our first night at Ardmore NZMCA before travelling back to the Waikato. But first we had arranged to meet Dawne and Bob, and Wayne and Beryl for lunch at Half Moon Bay Marina, because they were keen to see the caravan. It was not surprising to find this place buzzing, with a view like this. Fortunately we were able to park the caravan and ute in a boat trailer park at Bucklands Beach Yacht Club nearby. Pretty Half Moon Bay Marina with Rangitoto in the background. We made it to Ardmore NZMCA by mid afternoon and set up camp. Setting up with a caravan takes more time than it does in a motorhome with stabilisers etc, but I’m sure we’ll get more proficient as time goes by. John is experienced and confident with towing and backing. I won’t be doing any driving as my vision is limited with sight in only my right eye. It was a beautiful evening. The camp wasn’t full, and the blossom trees as you drive in were lovely in the afternoon sun. All good so far. We slept well and are thrilled with the layout and feel of the caravan. Next day we have to head back to Rotorua for an afternoon appointment, so we’re up early and preparing to move when John notices one of the tyres on the caravan. It’s flat! We phone our insurance company for roadside assistance, (we’re told our policy hasn’t been entered into the system yet but no matter, she’ll enter it now – we’d only taken it out the day before), and within minutes we get a phone call from the tyre company to say they’ll be here in a half hour. And they were. Great service. They found a screw embedded in the tyre. In no time the spare was on, and they took the other one away to repair it. It would be ready for us to pick up on our way out of town. And it was. We had an uneventful trip down to Rotorua and arrived in time for John’s appointment. I thought we should go to Government Gardens to see the tulips before we headed home to Putaruru. Click on individual images to enlarge. They’re beautiful. Tulips making a stunning display in Rotorua’s Government Gardens. The Blue Baths have been an institution in Rotorua since 1933. I love the building. We left our home of the last six weeks in Putaruru when our friends arrived home from their European trip on Sunday October 14. Life on the road again, here we come. We’re spending this week in Taupo at the NZMCA park at the airport. This is a great spot. Watching sky divers coming down is a continual fascination, and dog owners can still enjoy the facilities here as long as their pooches are on leads. I took a walk down to the roundabout on the ETA one evening. An evening view from the roundabout looking down on the DOC reserve at Five Mile Bay where freedom camping is allowed. It looks like a busy night down there. Click for high res and you’ll be able to see all the campers parked up for the night. Whatever you are doing over this coming long weekend, take care and be safe. I finally got to read this. Great way to keep a record of your experiences.